Simply put, this law says that energy can neither be created nor destroyed. Heat is a form of energy, and knowing this means that heat is not being lost in your home, simply relocated. This is why ensuring that your home or commercial building is well insulated and airtight can keep heat inside (or outside) much longer. Heat energy is not destroyed, which is why well-insulated thermoses and other areas stay hot for so long. The same principles can be applied to your house or commercial building, which is why it is so important to have good insulation and an airtight building. Temperature is determined by the speed and number of molecules in motion. Specific heat is the precise amount of heat output needed to raise the temperature of an object, such as a room or building interior. Air has a lower specific heat than water, so it takes less energy to create warm air to pump into a room. However, water holds onto heat energy much longer, so once it is heated, it takes less work to keep it warm. This is the theory behind boilers and radiators or water-heated radiant floors. Water-based radiant heating systems are one of the most energy-efficient ways to heat a building, and are considered an important component of green design. Conduction and convection are two ways in which heat is transferred from one location to another. One way to describe the difference is that conduction is passive heat like a radiator or radiant floor heat and convection is active heat like forced air. Efficiency is increased in conduction when you increase the surface area that is exposed to the area you want to heat. Convection is most efficient in an airtight room with a high insulative value. When designing your building’s heat system, the best choice for you will depend on whether you want to keep a place constantly warm with little to no variation, or if you want to be able to heat a room quickly for only a few hours. Entropy is the concept that when you transfer one form of energy to another, not all of it is converted to the type of energy you want. Because of this, you will always put in more energy than you get out. Fire-driven heat sources give off two forms of energy, light and heat. Machinery that produces heat will lose some energy to friction and kinetic motion. 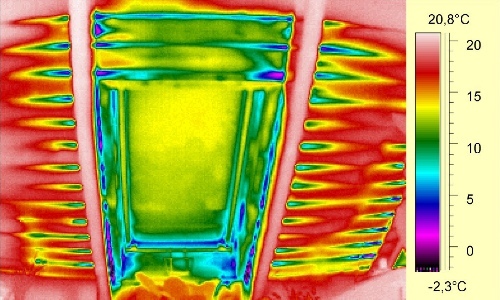 This is why conserving energy is such an important concept when it comes to heating and cooling an efficient building. The more you create, the more you lose in translation. Fireplaces are pretty, but they are not efficient heat sources. Heat pumps are great for temperate climates when you need to raise the temperature by only a few degrees, but they are not perfectly efficient either. Machinery such as a furnace can be examined for its efficiency, and this number can help you to understand the cost of electricity or gas that it will take to get the temperatures you desire in your home or commercial building. For more information about thermodynamics or to learn about insulation, contact USI online to find a branch near you and get a free quote. USI believes in excellence in every step of the process and ensures timely completion and quality of service, time after time.